Cool Features: Absolutely gorgeous, enchanting photography...I get lost in the pages...just want to run my hands over the paper in hopes that I will be transported directly into the book. The stories and memories woven throughout make this more than "just a cookbook". My Thoughts/Review: I adore this book...as I said, I want to stroke the pages. From the moment I read Steele's tale of passion for the "colors, textures, shapes, and flavors of select fruits" in the introduction (entitled a gate at the window), I knew I'd be a sucker for anything that followed. It is obvious that this is a labor of love about fruit and using it in its growing season. It is a visceral memoir with recipes, quotes, and mesmerizing photos. Steele encourages using her recipes as guides...substituting with what is local and in season for you. I want to leave you with a small portion of the introduction; hopefully you will feel that pull that I do to pick up this book. 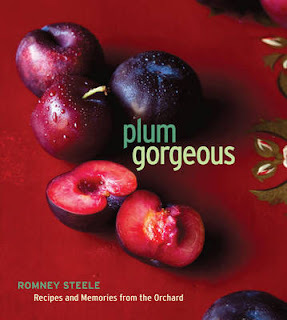 "Plum Gorgeous is surely a book about the sensuous and enchanting nature of fruit and what to do with it in the kitchen. But more than that, it's about the pleasures and joys of the table: my own "longing for a touchstone" and a place to return to; the memories, maps, and connections that abound around each recipe; and the stories and tales that come with each." While they are still cold, score skin side of duck breasts. Season w/ coriander, salt, and pepper. Leave at room temperature, loosely covered, for 30 minutes before cooking. Gently warm the honey with a pinch of cinnamon. Reserve for basting the duck* and adding to the salsa. cherry salsa: Meanwhile, make the salsa. Combine all of salsa ingredients in a bowl with about 1 Tbs. of the reserved honey. Stir and season to taste with salt and pepper. duck: Heat a nonstick skillet over medium-high heat. Add duck breasts, skin side down, and then immediately decrease the heat to medium-low. Cook until the fat is rendered (pouring off as you go) and the skin turns a deep golden color, about 10 minutes. While cooking, brush the breasts with a little warmed honey. *Be very careful with this step. The honey caramelizes extremely quickly when it drips down onto the pan, turning the skin very dark. Turn breasts over and cook to medium-rare (130° F), a few minutes more depending on thickness. Transfer to a cutting board, cover loosely with foil, and let rest 5 minutes. Slice breasts on the diagonal, arranging slices on plates. Top with salsa, drizzle with any remaining honey, and serve. 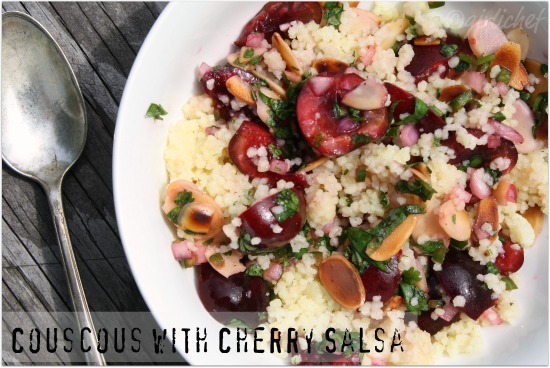 Stir cherry salsa through cooked couscous and finish with a drizzle of olive oil...simply delicious. That looks like a gorgeous book! I love the recipes you said you'd like to try - those look right up my alley, too. That duck breast looks cooked to perfection. The color contrast with the cherries is also just divine. Beautiful work! Love the book! The duck breast with salsa looks to die for! You got me with the title and that cover photo. Great combination. Without question, this IS plum gorgeous!!! OMG Heather this is amazing! First of all, tell the publisher you just sold a book! I absolutely love these flavors and these fruits highlighted in this book, and if all the recipes are as fabulous as the one you made (gorgeous photo) then I have to have it! I may even try this recipe. LOVE! This book looks fabulous...I must try that cherry salsa recipe! My goodness your dishes do look gorgeous! Vaya platito delicioso, me encanta como te ha quedado. What a beautiful cookbook! And the recipes sound wonderful as well. Thanks for sharing this! This sounds like SUCH a lovely luscious cookbook. It's rare to find one quite this sensual. Keeper. And oh that dish! I just bought a huge bag of cherries so I might just have to make it. I love cherries! i have to try that cherry salsa! I have to get that for my mom for her birthday, she loves plums, cherries and... well, fruit really. And colorful cookbooks, she has quite a collection. Perfect duck - pairing with those reddest stolen cherries and I am enchanted. Lovely review - you have me mesmerized. Great review I adore cherries and I think this cookbook needs to be in my collection. Thanks for linking up to Weekend Cooking. Cooking duck has always scared me a bit...but this might just be the recipe that finally gets me to try it! Gosh, this looks truly mouthwatering! I was so tempted to make the duck along with the salsa too--it looks so good. ;-) Wasn't the salsa great with the couscous?! This really is such a wonderful book. Definitely try the Cherry Clafoutis sometime too--so good! Giant SLURP!!!! to both the recipe and the cookbook. Thanks for sharing with Presto Pasta Nights. That looks heavenly. 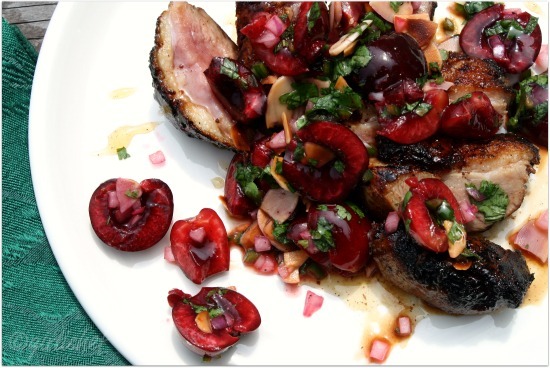 Duck and cherry salsa!!! I am all over that. Thanks for posting such a great recipe. The book looks absolutely stunning. The cherry salsa is intriguing, sounds like an awesome flavor! @Romney ...EEK, I'm starstruck! =) Thanks so much for stopping by and really...such a gorgeous book. I can't wait to get my hands on My Nepenthe. And yes, divine is the word for it. I so enjoy duck and rarely see recipes for it's prep on the blogs. The cherry salsa is just as described in the book title, 'plum gorgeous'. Your seasonal cooking is inspiring to me! I just had a salad with plumbs the other day and it was surprisingly tasty. Can't wait to try these recipes.